Finding a good soundbar that is affordable but also decent used to be extremely hard. These days the things are very different. No longer do you need to save up for a $200 unit to even get some good results. We have moved past that point and entered an era where affordable doesn’t necessarily mean bad. Today we are going to show you some of the best soundbars you can grab for less than $100. These models have been proven many times by now, and all of them come packed with a healthy set of features. Let’s take a look. A truly gorgeous design that looks far more expensive than it is. Streaming works really smoothly without any hassle. A finely honed listening experience that ticks all the boxes. Some users prefer a more granular volume control. VIZIO has done a fantastic job with the SB2920-C6 model. Straight out of the box, you can tell that this is a device which is going to exceed what is expected of its price point. The design is gorgeous, and the listening experience, on the whole, entirely lives up to your expectations. This is a design which falls on the smaller side of what is available in the form factor, and that is worth taking into consideration when weighing this option against similarly priced models. 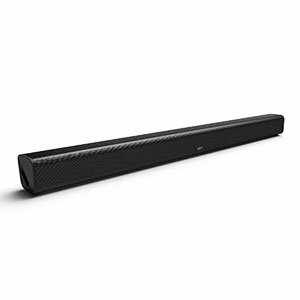 Despite its size, it is capable of outputting a good deal of power when it comes to volume levels, and the bass response, in particular, does well to outperform our expectations of a small soundbar. A design that feels surprisingly premium and looks the part too. Sound quality is good, and especially beneficial for TV viewing. Bluetooth works well and is a nice option to have. The remote control is poorly made, and the sensor is a little misplaced. Richsound Research’s TB220Ls make for a fantastic entry point into the wide world of soundbars, and can serve as something of a gateway drug to the ever expanding home cinema experience. Highlights include a sleek, versatile form which looks just as good under the TV as on the wall, a punchy, dynamic sound quality, and solid streaming. The aesthetic design and build quality set the TB220Ls apart from a lot of products which compete with it at the price point. The whole device feels well made, robust, and more of a premium product than its price tag would seem to imply. Despite a remote control that leaves a lot to be desired, the overall effect is undeniably powerful and effective. The triple sound modes provide a good amount of control. It was able to play pretty loud without much noticeable distortion. The design and build quality are lacklustre and don’t compete with alternatives. Listening experience is louder but not necessarily improved otherwise. 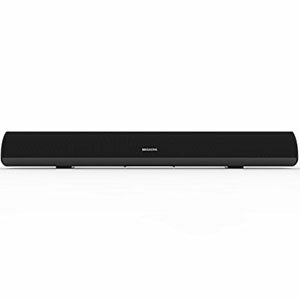 The AmazonBasics soundbar is perfect for someone who is primarily concerned about replacing their native TV audio with something that has a little more punch. The triple sound modes offer decent customization, but an underwhelming design and build quality alongside mediocre sound improvements make this a fairly niche offering on the whole. 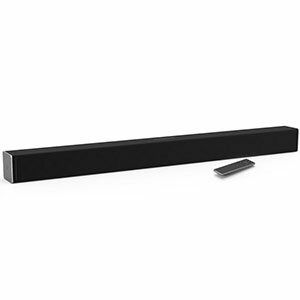 Unless you are a big fan of the AmazonBasics brand, or just want to purchase something which is solid enough to do the job without doing a whole lot more, there are not a huge number of compelling reasons as to why you would settle on this soundbar above other similarly priced models in the category. The sound isn’t bad, by any means, but it does not compete well. It has all the right features. Good sound for the money. Solid wood construction offers good aesthetics but also the necessary durability. Being the oldest successful solid body guitar, it is really not that surprising that Fender Telecaster has found its place on our list. The specific model we are looking at today is a Fender American Special Telecaster that comes with a blonde finish and a soft, maple fretboard. Best thing about this guitar is that it’s retro but still modern. ​Fender has opted to go with a Texas Special single coils for this build. These are Telecaster specific pickups which definitely capture a lot of that classic Telecaster sound the whole world has grown to love. On top of that you get Fender’s standard hardware which is probably the most solid thing about their guitars. Overall a must have model. While design and aesthetics don’t necessarily define how good a soundbar is, TaoTronics’ TT-SK15 is one good looking model. They have packed it with four full range drivers which are capable of delivering healthy levels of volume, as well as definition. Those who value aesthetics will definitely appreciate what TT-SK15 brings to the table. Thanks to those four separate drivers, the TT-SK15 is capable of outputting far more power across all ranges of the audio spectrum than you might expect from a soundbar of this size. It is worth noting that you will be sacrificing significantly in terms of the playback and reproduction quality if you opt to blast the audio at full volume, but this is generally true across the board. The beauty of an electric guitar is there are so many manufacturers, models, shapes and styles. Why? Because everyone has different tastes. So the word ‘best’ is relative to the player. For example, hand me a $350 Ibanez Roadstar and I will happily play it for hours. Give me a $2,000 Telecaster and I will probably shrug. What Can You Expect From A $100 Soundbar? Models found in this price range offer the basics of what this type of device is capable of delivering. That usually means two full range drivers which are 2″ in diameter, Bluetooth connectivity and rudimentary controls. 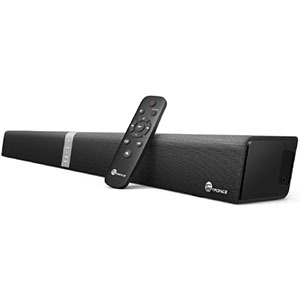 With that said, soundbars such as our top pick on the list, bring a lot more. This is why you will hear people say that some of the best soundbars you can find are currently at the top of the $100 range. However, that is a very rare exception to the rule. The amount of control you a $300 soundbar offers compared to the segment we are talking about today, is far better. Same goes for features and performance. Affordable soundbars are there to give you a better sound quality than your TV is capable of doing. Most entry-level to midrange TVs often feature pretty terrible speakers. After all, manufacturers are can do only so much in terms of audio before the design of the TV starts to suffer. That is unless they want to invest in an adequate set of speakers. In other words, even a $100 soundbar will vastly improve your TV experience. One of the biggest gripes many users have with models in this price range is the lack of lower end response. This is a direct byproduct of being limited to two rather small full range drivers. However, there are many models of affordable soundbars which either come with a subwoofer or feature an extension port for one. This way, you can get a decent amount of bass. Where a soundbar in this price range starts to fall behind is sound quality. This is especially true for users who are used to high fidelity audio and want something similar for their TV. 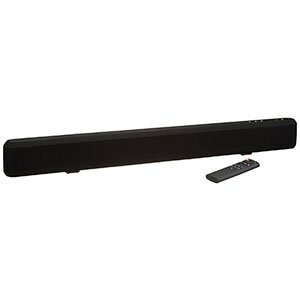 An affordable soundbar is there to give you more volume and increased definition. Those who need more than that will have to invest more money. Another thing to consider is the size of the room. Just like most speakers out there, room acoustics play a major role in the quality of sound you get. Since these soundbars feature two rather small drivers, they work best in smaller spaces. The affordable segment of the soundbar market is fairly diverse. You will find models which aren’t worth the money no matter how cheap they are, but you will also find some pretty decent units. In most cases, the performance you get will be far better than what your TV can offer. The only thing you really have to do is be realistic with your expectations. Soundbars we’ve shown you today are some of the best on that market right now and will give you the best bang for your buck. If you’re on a budget any of these will do great.